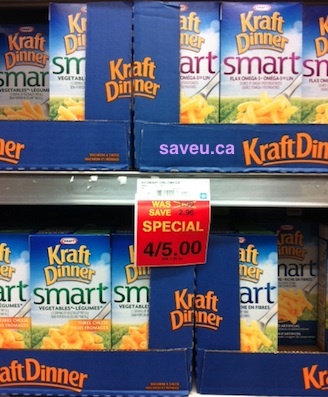 On Checkout 51’s list this week (April 11 – April 17, 2013) is Kraft Dinner Smart, any Kraft Dinner product. You will get $0.50 cashback at Checkout 51. Kraft Dinner Smart mac & cheese tastes like the classic cheesey KD kids love without the artificial colours. You can choose between four varieties: vegetable, vegetables three cheese, high fiber and flax omega-3. Here’s a pic of what it looks like. I found a couple prices of it at a few stores. I did not find any coupons for this.